I have a Circulon frying pan I've been using for a few years. I got it second hand in good condition. The non stick factor was great when I got it, but when I fry with it now, I find I need to use quite a bit of oil or it sticks. I've tried hard to clean off what seems to be a kind of oily residue, but I'm wondering if it's the last of the non-stick coating I'm trying to remove! Other than the stickiness, it's a great pan. Are this pan's non stick days over? Or otherwise, what can I do to restore it? Let's just mention that there are health controversies about using a broken nonstick coating and/or bare aluminium surfaces, and see them as controversies that are off topic here. Non-stick wise, this pan is wrecked. There is no practical way to fix a modern nonstick coating to original state yourself at home. It seems that some spray-on products used to exist, but these were not actually teflon based even if they were sold as teflon repair sprays, and did not give an equivalent result to industrially applied coatings. There are professional refinishing services, but the price of the refinishing plus shipping costs is about the price of a brand new medium quality pan, and even this could only work with a piece where all non-heatproof fittings can be dismantled from the pan itself; the refinishing process will involve baking it at a high temperature. The only thing that would be possible to do yourself, IF the base material of the pan is either stainless steel or carbon steel/cast iron/wrought iron, would be to completely get the damaged coating off and use the cookware as a stainless steel, or seasoned iron, piece. But with most non-stick cookware, the base is aluminium, which is not useful as an uncoated or seasoned cooking surface. EDIT: It seems there are seasoning techniques for some types of bare aluminium, they might or might not apply. As I mentioned, there are health controversies about it, so make informed decisions. I had (actually still have) the same problem. I have a non-stick teflon frying pan. Scrubbing with the rough side of the sponge didn't help and I could scratch the oily residue with my nails off the pan. The solution I had is to rub very gently the polymerized oil with steel wool off the pan. It was easier if the pan is absolutely dry. There is a chance that you'll ruin your pan - but I think the stickiness of your pan can't be worse than now. I recently cooked eggs sunnyside up in my nonstick pan, for 15 minutes. 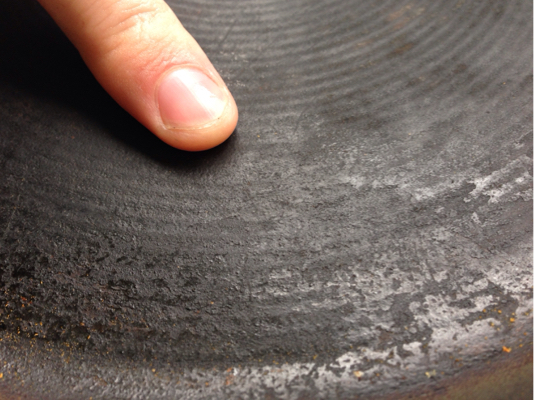 Once the smoke cleared, I noticed carbon deposits on the pan. They look remarkably like what you have on yours. Boiling a strong solution of baking soda in the pan for 15 minutes, then letting it sit til cool let me get the carbon off with a plastic scrubby. Sadly, although it looked nice, the pan was no longer non-stick. Try the bicarbonate treatment on the pan, but don't expect it to work. Most organic compounds carbonize at around 500°F, and your pan is likely rated for only 450°. Not the answer you're looking for? Browse other questions tagged equipment frying-pan non-stick or ask your own question. Utensil materials - plastic, metal or wooden? Lining a frying pan with aluminum foil to reduce post-cooking cleanup?